Most of us use tattoos to show our strengths or to convey how we overcame life’s challenges. 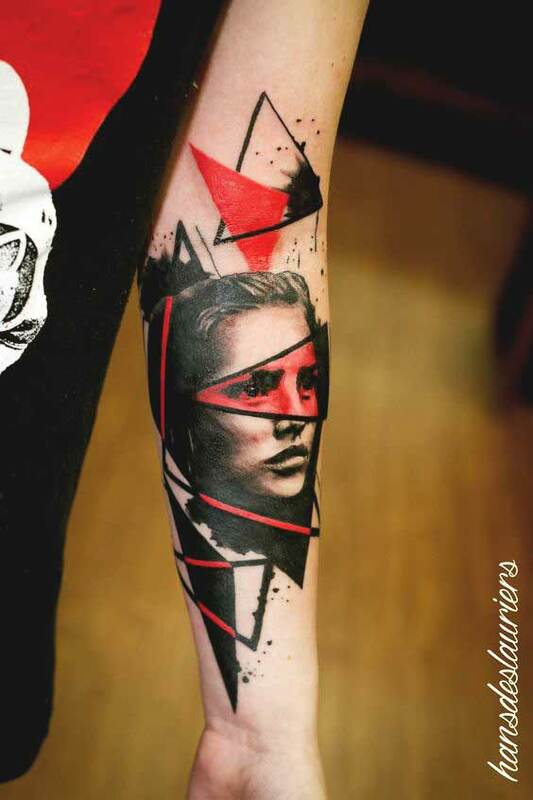 But trash polka tattoos are a bit different and they have a unique aesthetic too. Nevertheless, it’s still something that you might want to consider too. 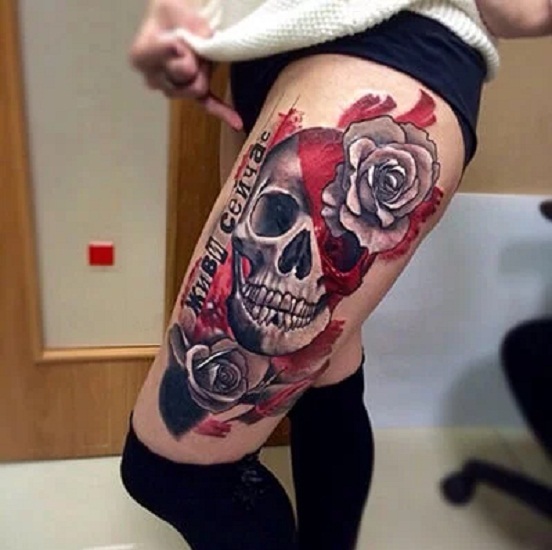 Many of us usually spend hours finding a tattoo that’s cute, classy, or something neat-looking that we can use to show a bit of our personality. 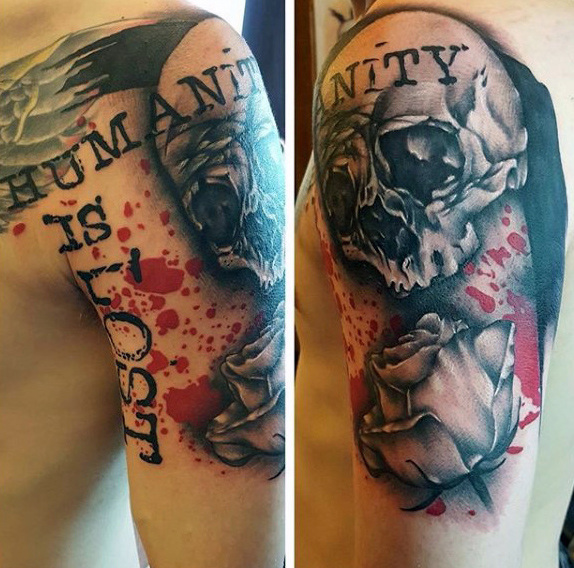 However, there’s this one tattoo that stands out from the rest mainly because of its unique and bold aesthetics and its meaning. 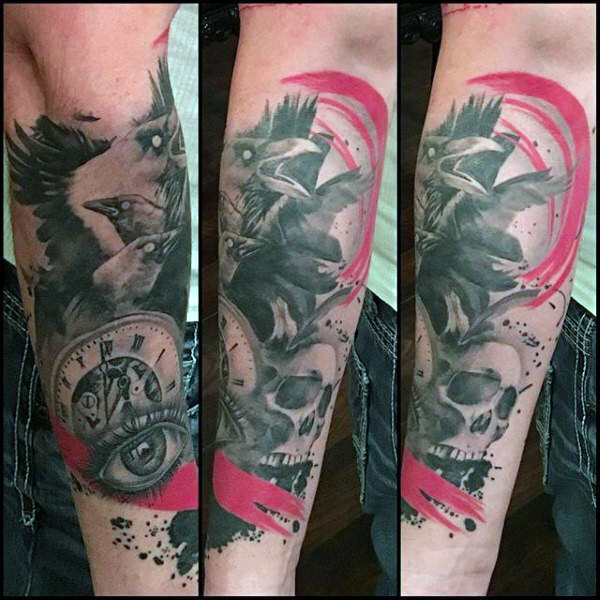 This piece is called trash polka tattoos. 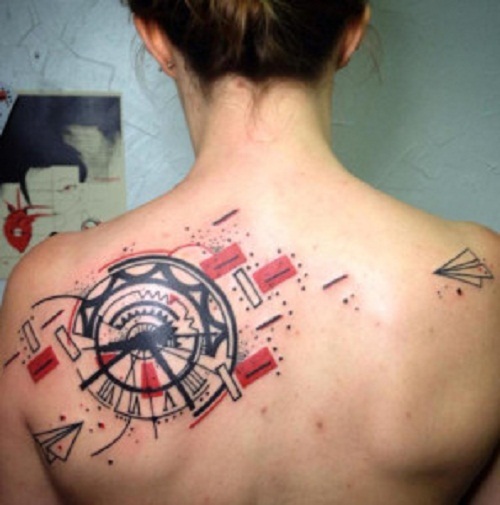 But what is a trash polka tattoo and where did it come from? 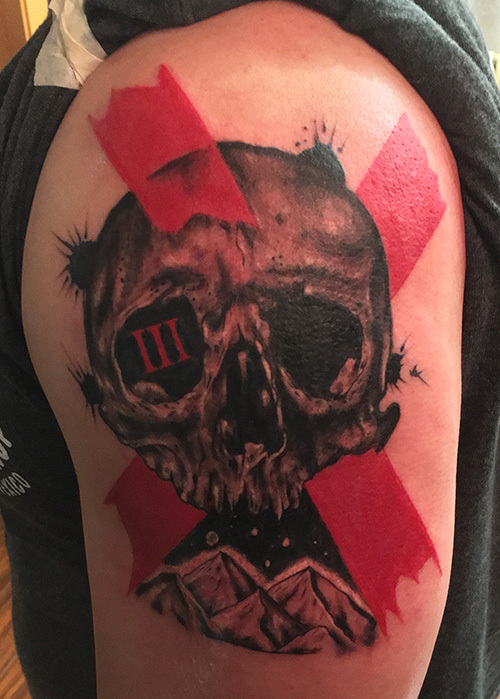 3 What do Trash Polka Tattoos Mean? 5 Should You Go for It? 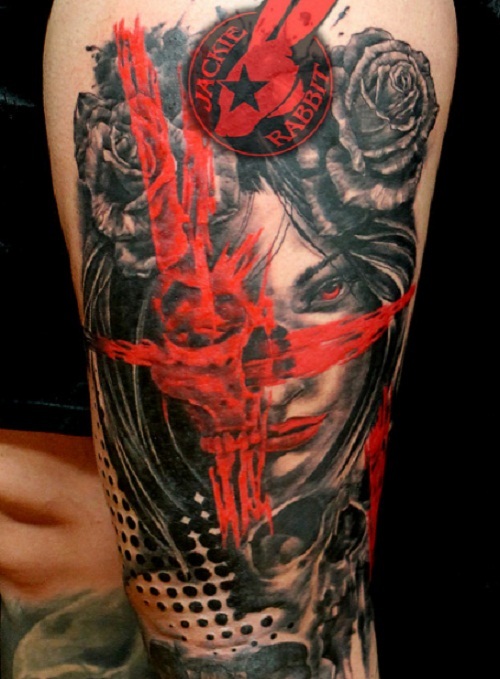 Additionally, the original trash polka tattoos are only made with red or black ink or a combination of both colors. 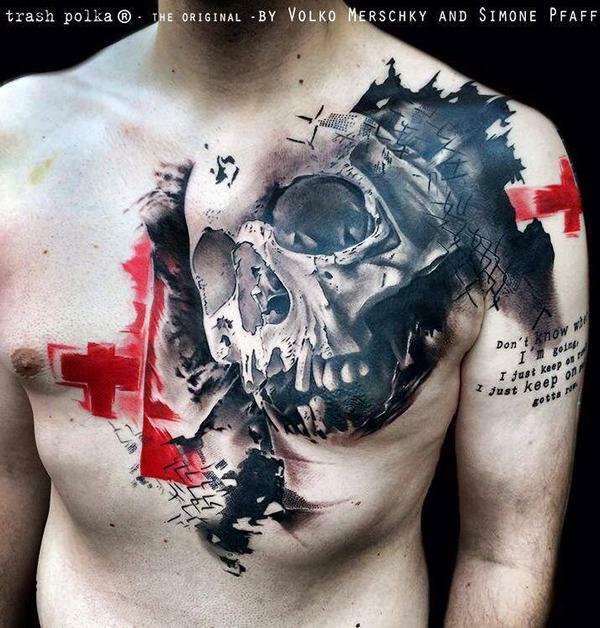 They may look chaotic but this type of body art is definitely something that you can say a beautiful mess. 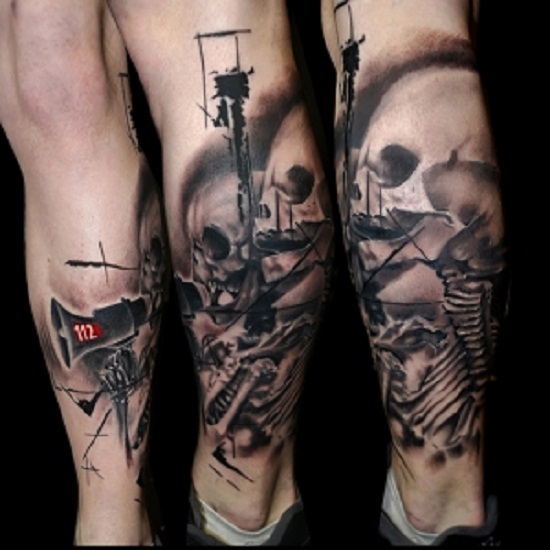 Trash polka tattoos were first made in a tattoo studio named, “Buena Vista Tattoo Club,” in Würzburg, Germany in 1998. 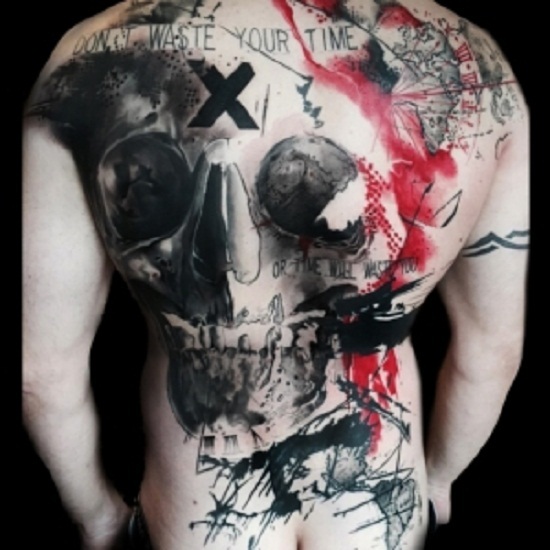 Artists Volker Merschky and Simone Pfaff initially called all their pieces as “trash polka.” They derived inspiration from life itself, contemporary art, and even artists outside the tattoo industry. Over time, their works became popular. 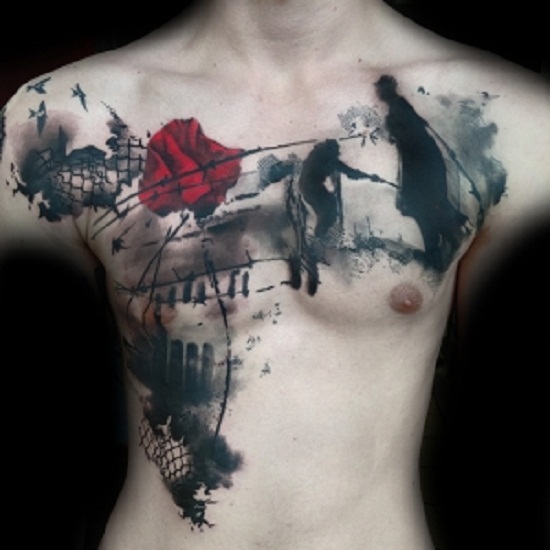 Their pieces started to shape into a style and influenced the world of body art. Today, the world now recognize it as an independent style and is getting even more popular among men and women. 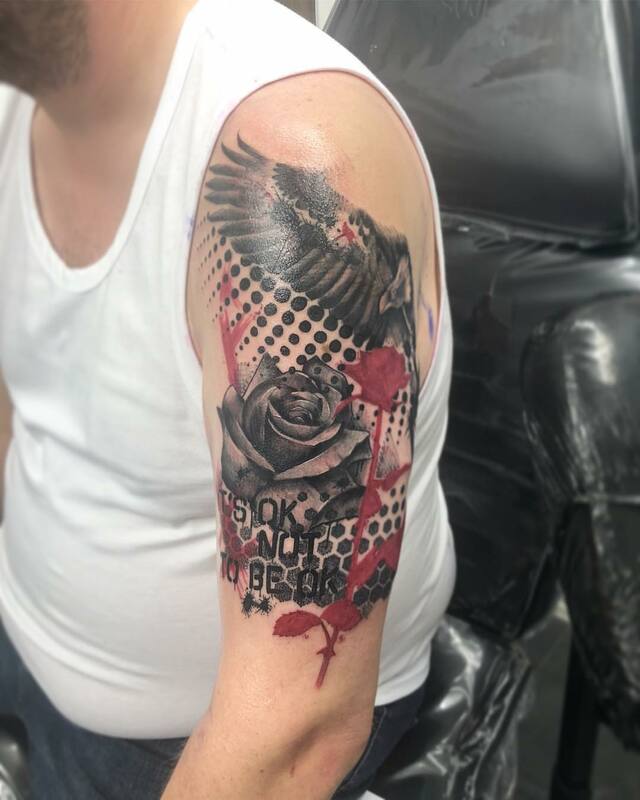 What do Trash Polka Tattoos Mean? 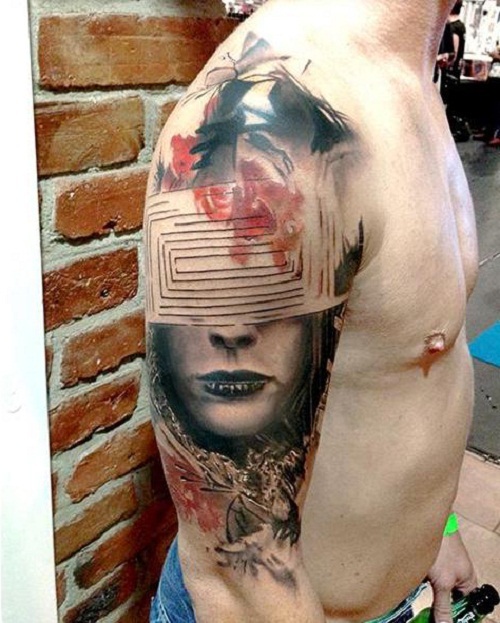 The trash polka tattoo isn’t your ordinary tattoo. 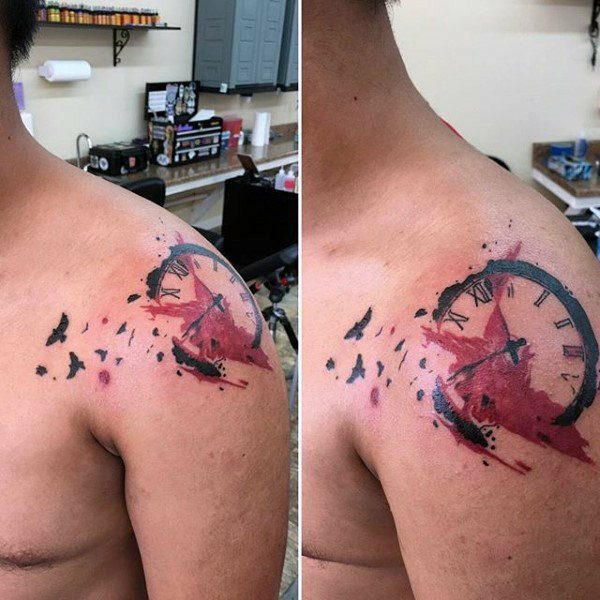 It’s not like an owl tattoo that can represent your personality nor is it a cute fox tattoo that can protect you from misfortunes. 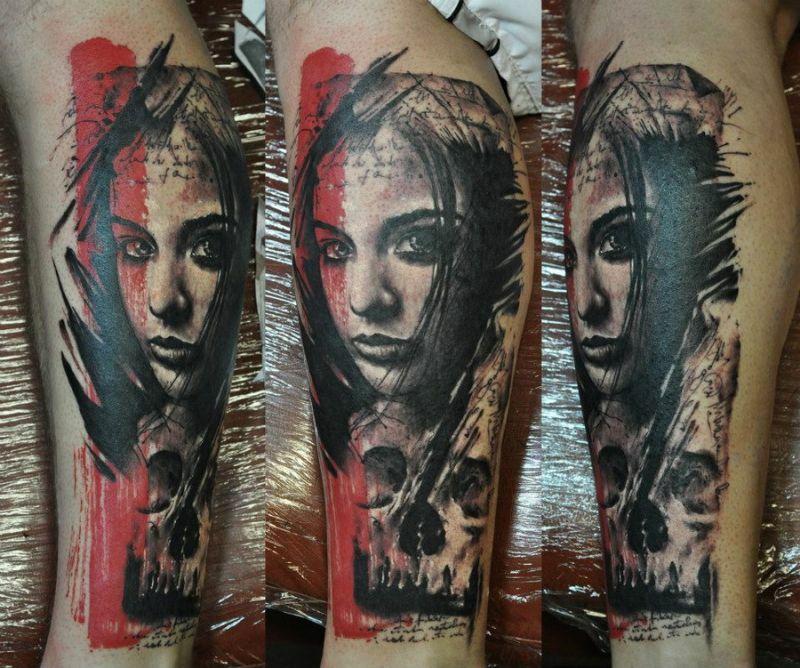 Rather, it’s something that breaks people’s view of death and chaos, as well as the rules of tattooing. 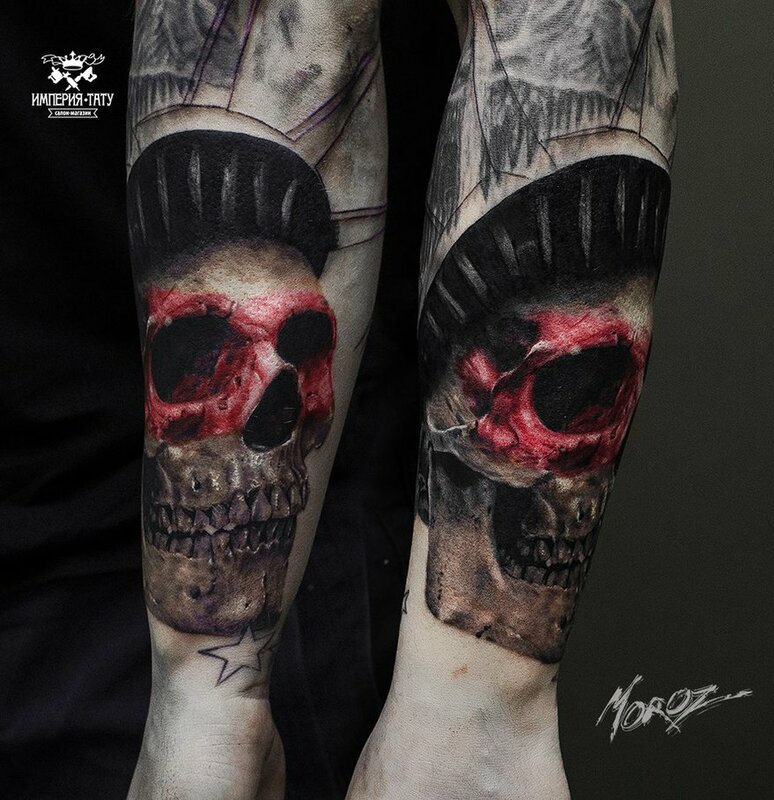 Moreover, a trash polka tattoo aims at showing rebelliousness and boldness through its images. You can use it to represent irony or your protests to the society. Apart from that, you can also use it to show your contempt or disagreement towards the common routine and mediocrity. Trash polka tattoos aren’t something that you commonly see in other people. 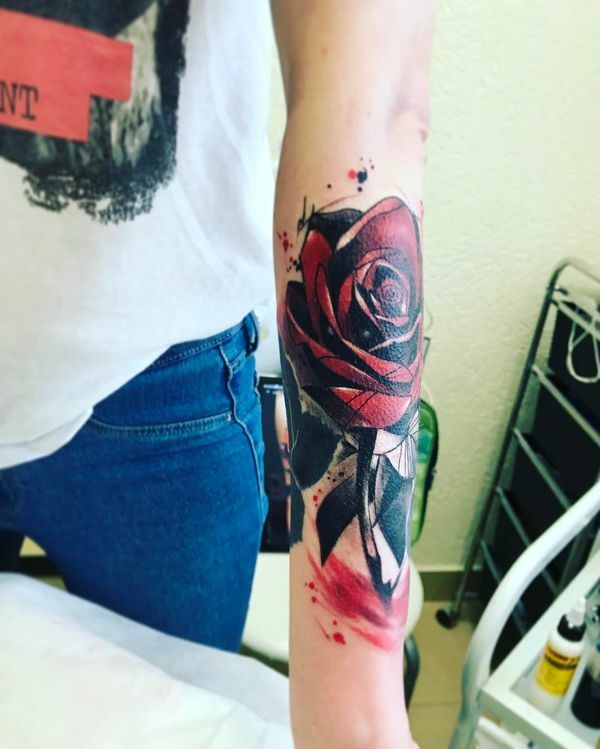 It’s rather unique so if you are thinking of getting this tattoo, here are some things you need to consider. 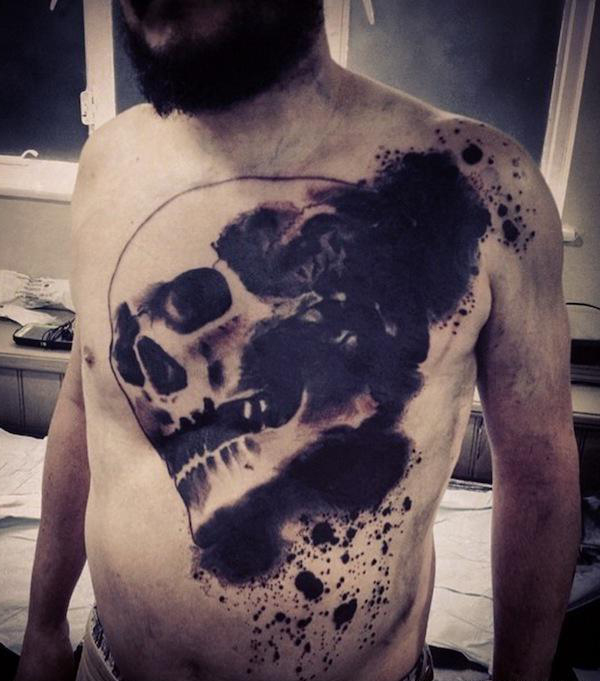 Opting for large pieces of tattoo is already a dauntless decision. But having trash polka tattoos is bolder. 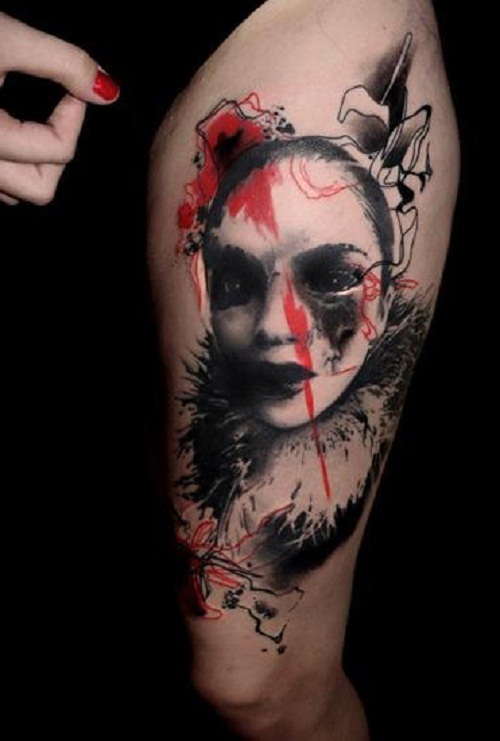 Trash polka tattoos attract attention mainly because it has bold lines and black and red inks are heavily used. It’s something that is often dramatic as well. 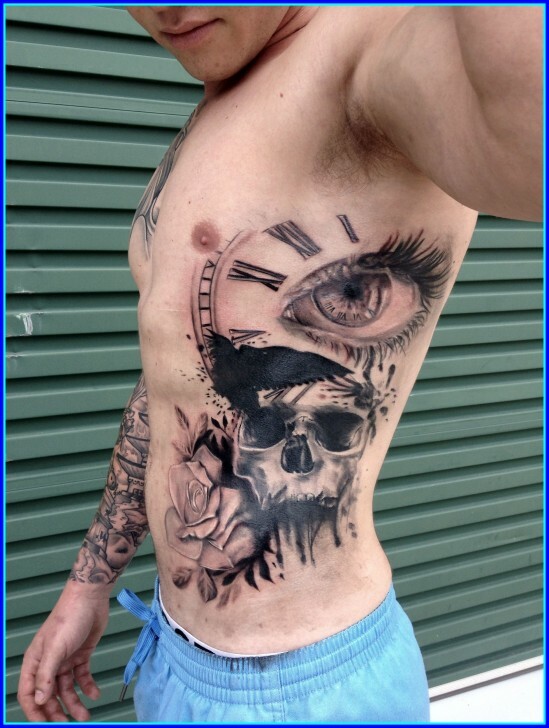 Again, trash polka tattoos are a combination of various styles. Thus, it would be hard for you to find the right piece. Additionally, it originated from Europe and while it’s already considered as an independent style, it’s still starting to grow more popular around the world. Thus, if you’re not in Europe, finding a tattoo artist for your trash polka tattoos can be quite hard. 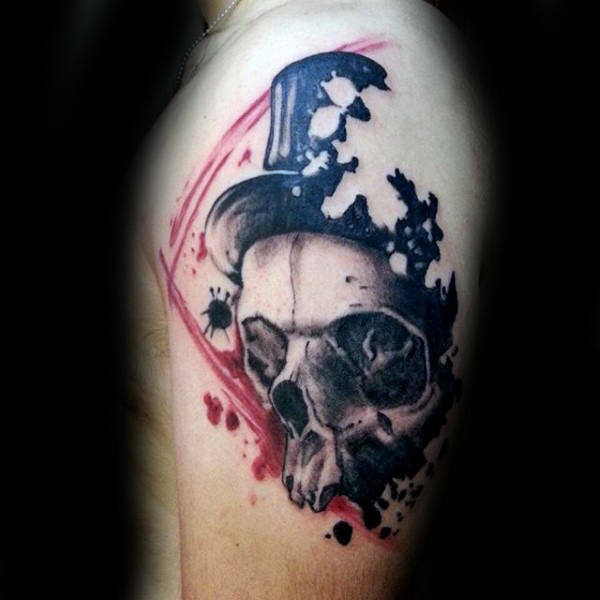 Plus, with not much experts in the said tattoo styles in your area, you might not get the exact design that you want. 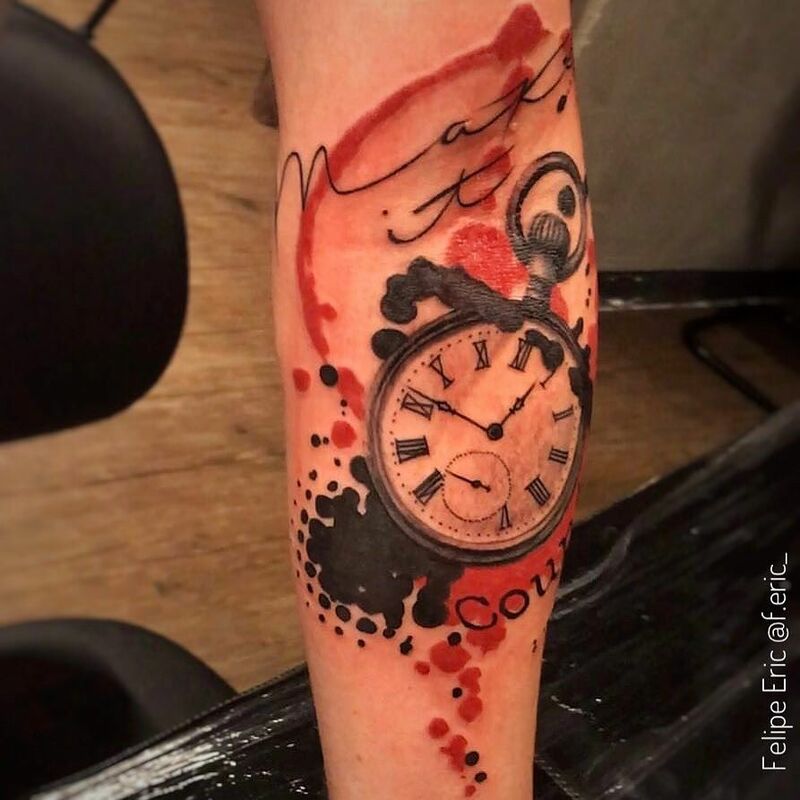 Trash polka tattoos are very unique. It makes use of different images that may not exactly relate to each other. 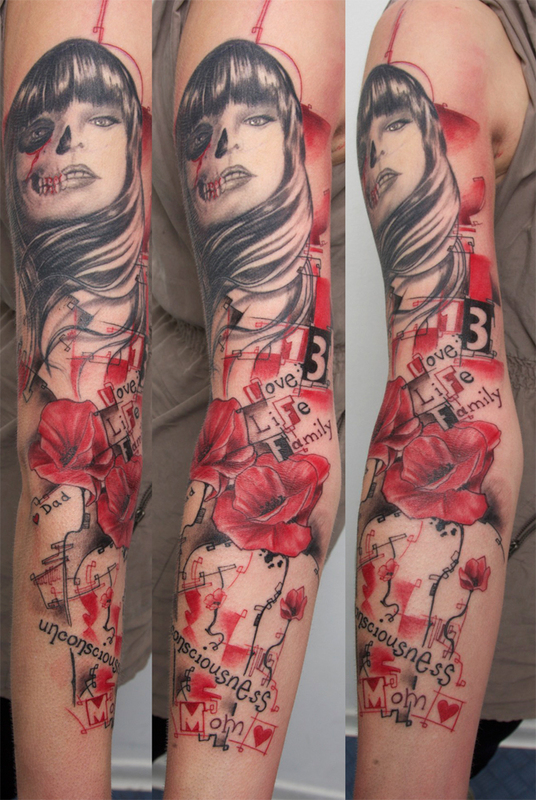 Thus, it’s hard for some to appreciate it just as most tattoo enthusiasts. 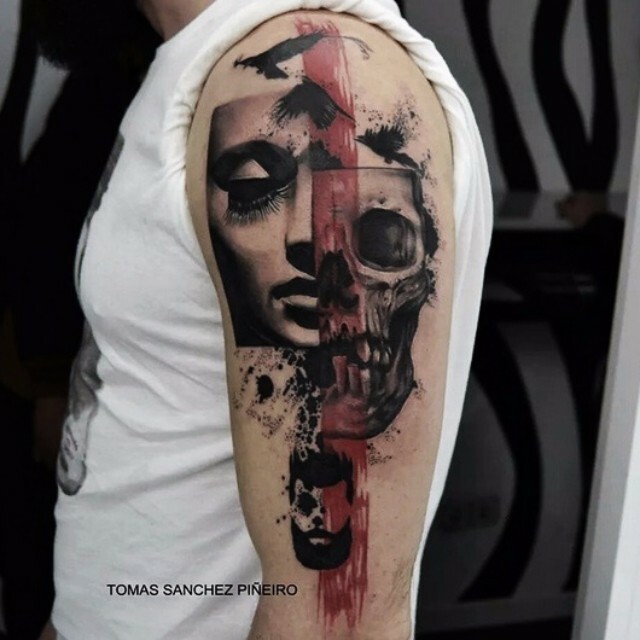 Its messy-looking style can also affect other people’s view of you, especially in the professional world if your trash polka tattoos are placed in exposed areas in your body. 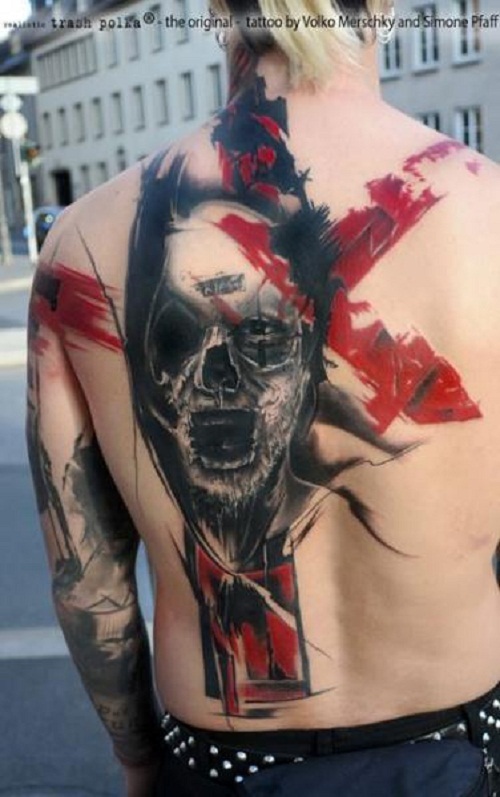 People have strong responses to trash polka tattoos. It’s either they love it or hate it; there’s actually no in-between. 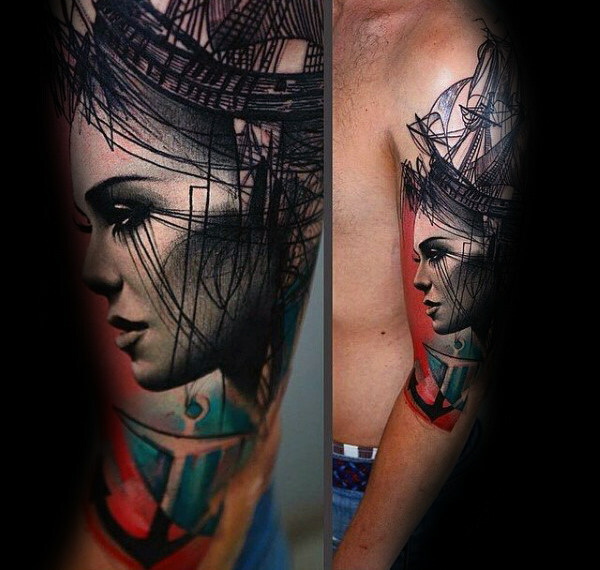 If you love this tattoos style, then, definitely go for it. 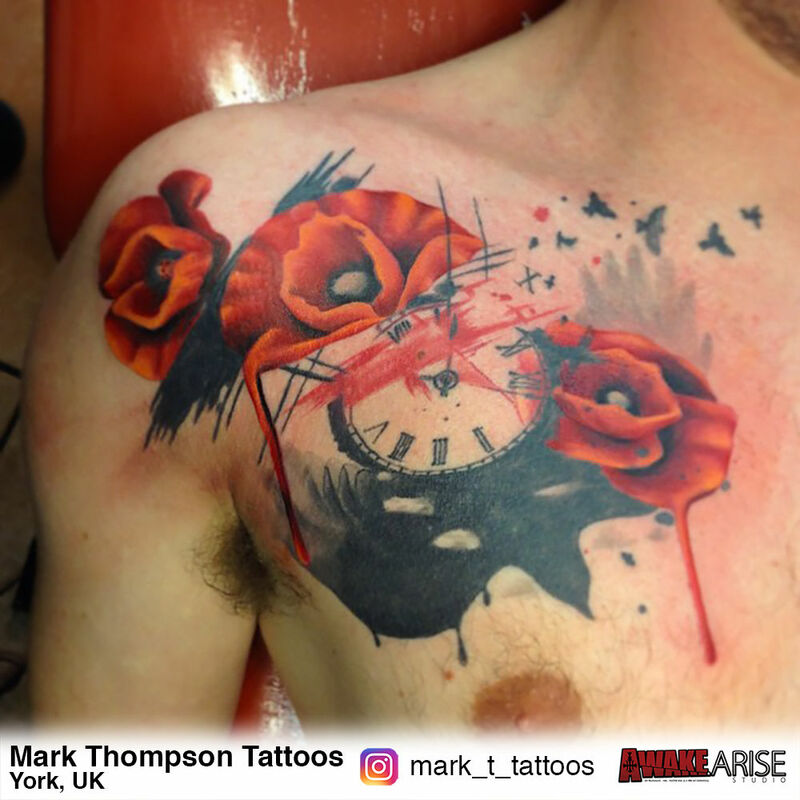 Trash polka tattoos offer a one-of-a-kind aesthetics that you will not see in peony tattoo designs or other common styles. Plus, they look good on both men and women. 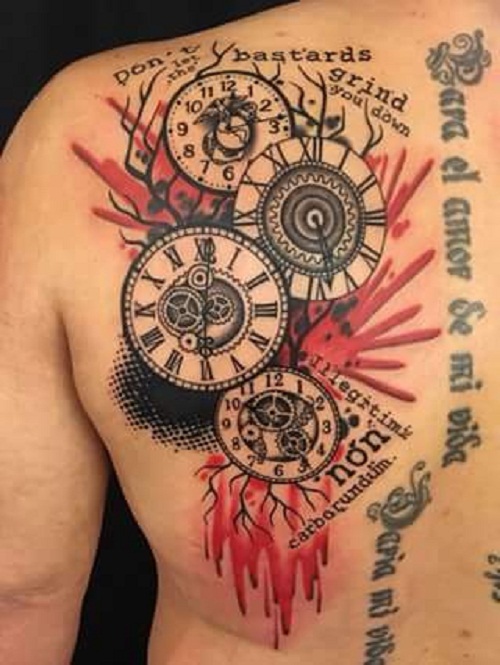 Life is too short to let this unique tattoo style pass. 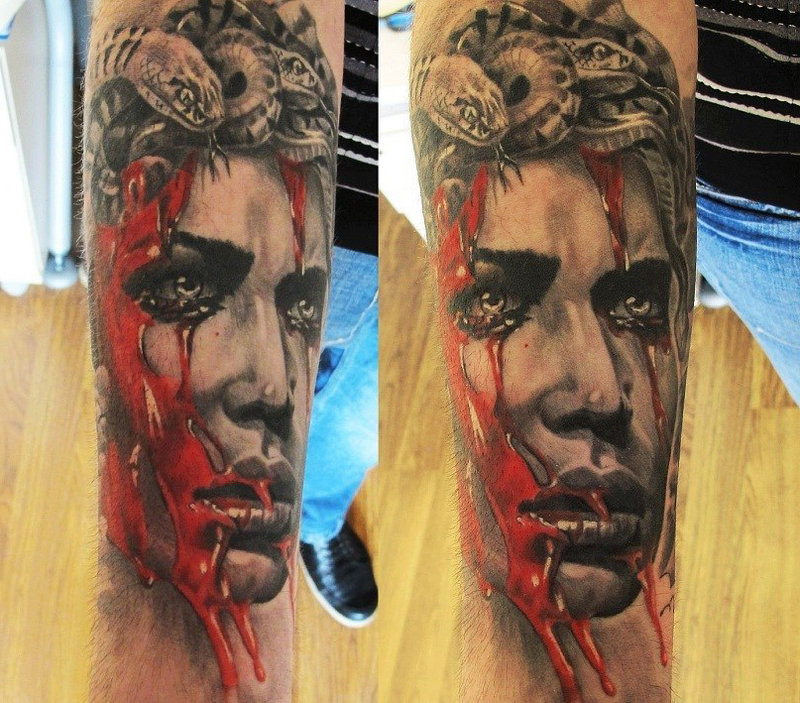 Trash polka tattoos are very versatile as you can match it with almost any symbol. They are gender-neutral as well. However, it’s not that popular among women yet compared to men probably because of its unique messy aesthetics. 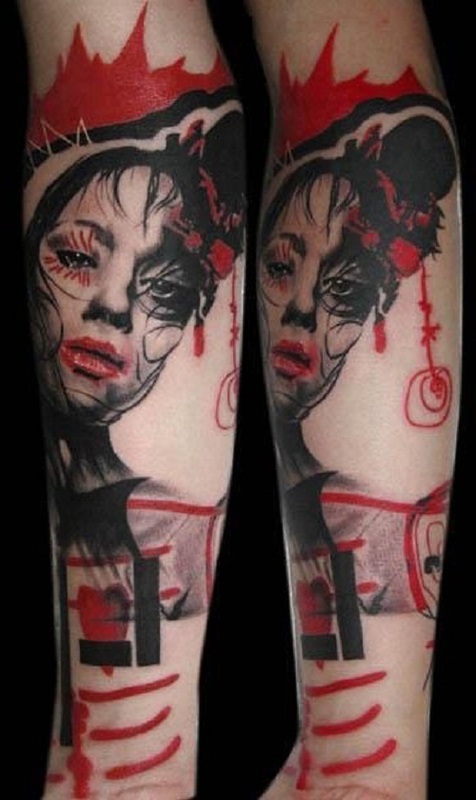 But if you are a little edgy, here are some patterns that are often included in trash polka tattoos for women. 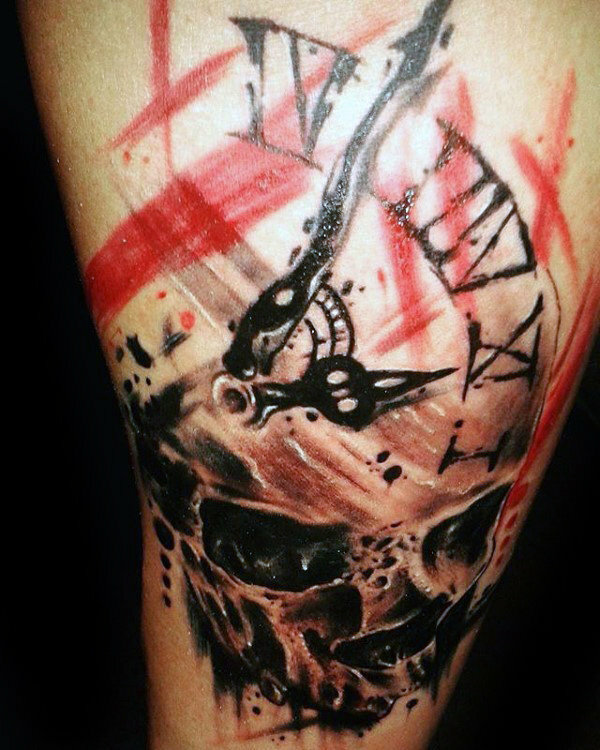 Since trash polka tattoos exit on the ideas of death and chaos, you’ll find many trash polka styles with this pattern. 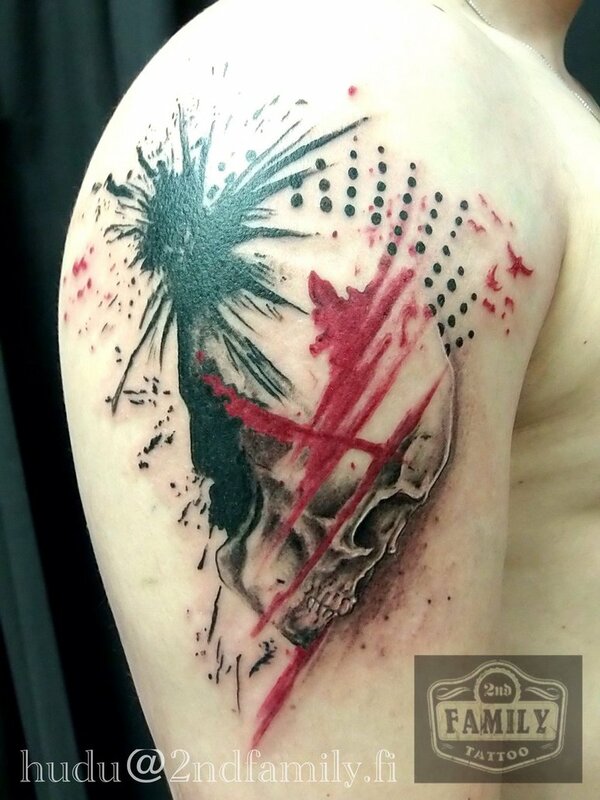 Additionally, skulls give aesthetics that suits the messy style of trash polka tattoos. 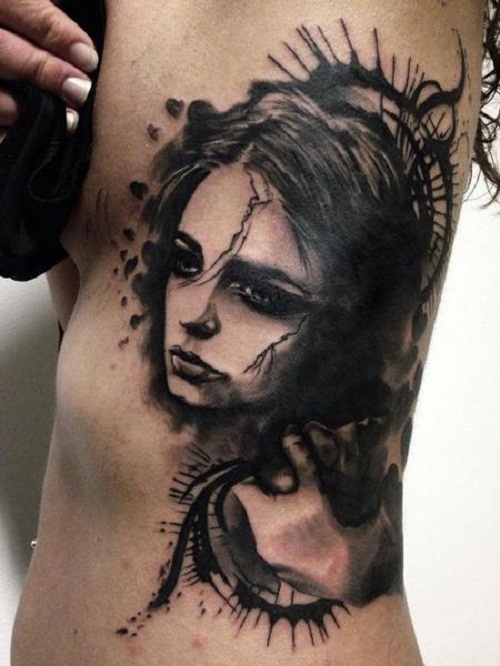 The face, particularly of a woman, is one of the most prominent features in trash polka tattoos. It has different variations. Some of which is a face without eyes, a half-rotten face, half-bloodied face, or sometimes a celebrity’s face with red accents. 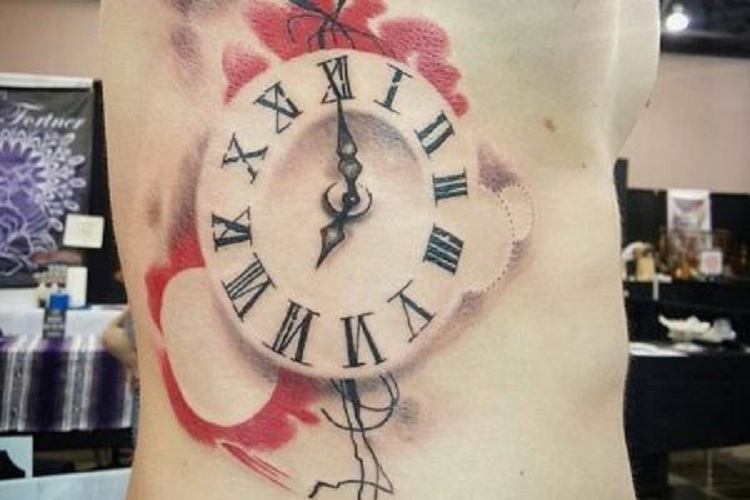 For most tattoos, the clock is one of the symbols that are timeless. 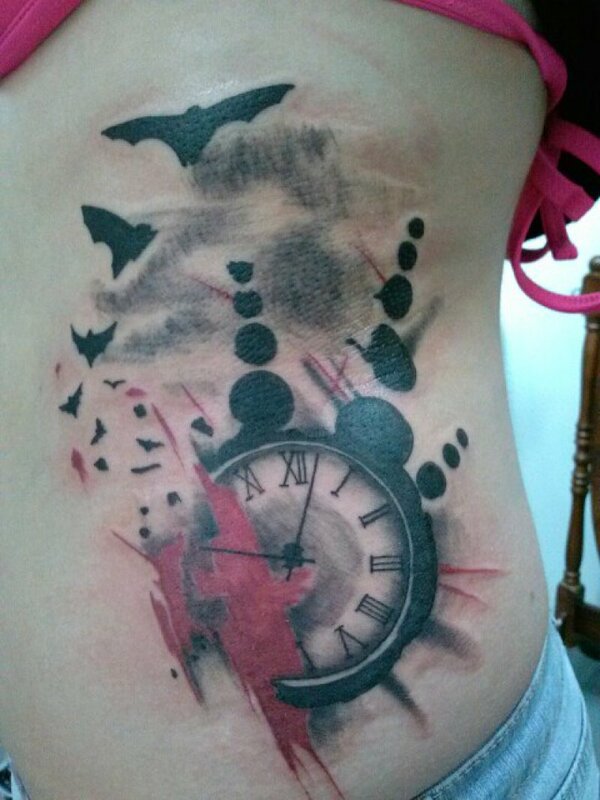 For the conventional tattoo designs, it represents transience. 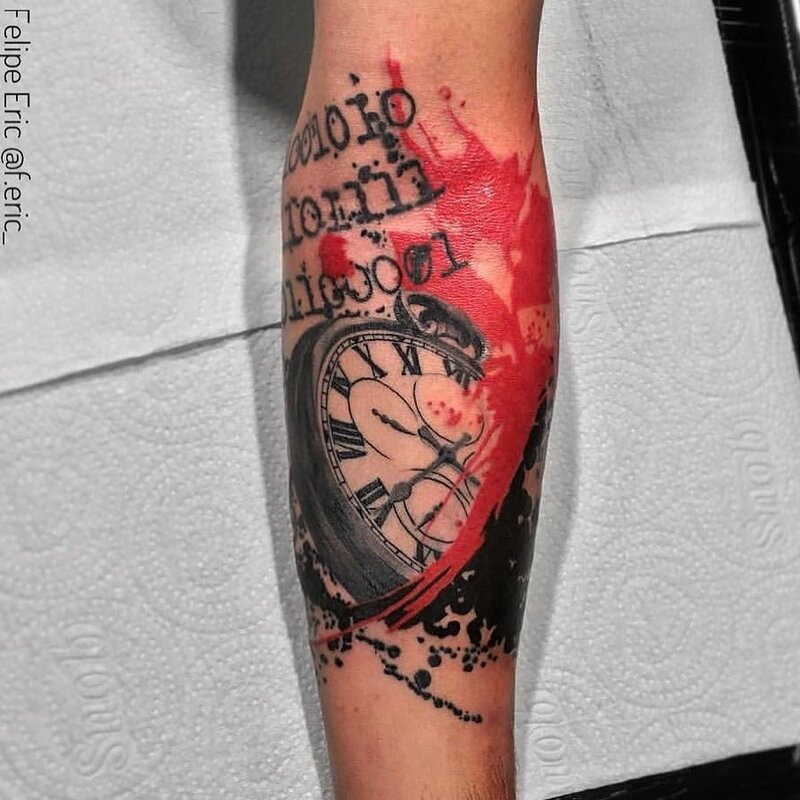 However, for a trash polka tattoo, it marks a moment in a person’s life that he or she wants to remember. 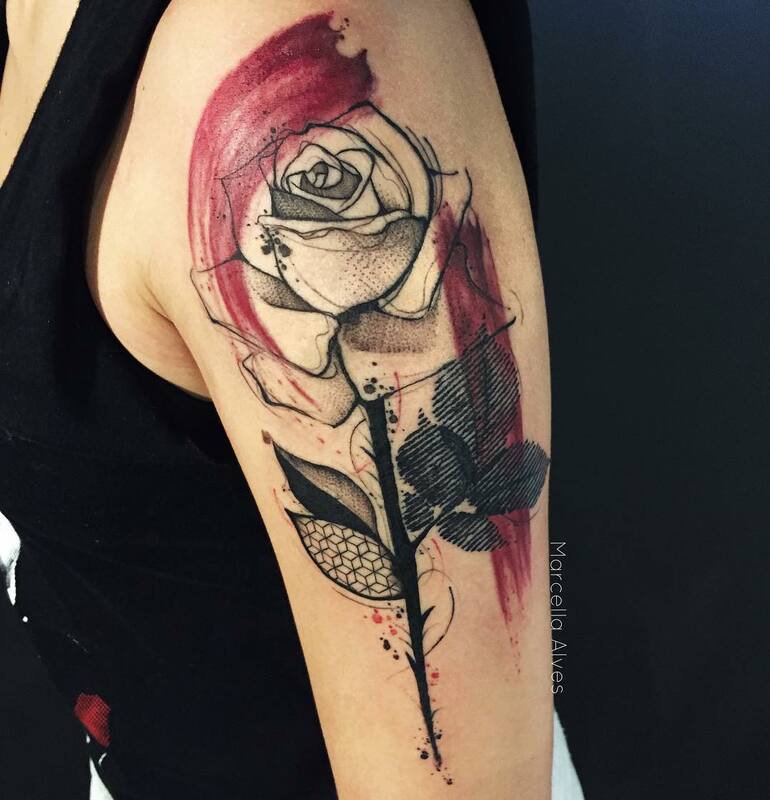 Trash polka tattoos can blend with flowers as well, especially roses. 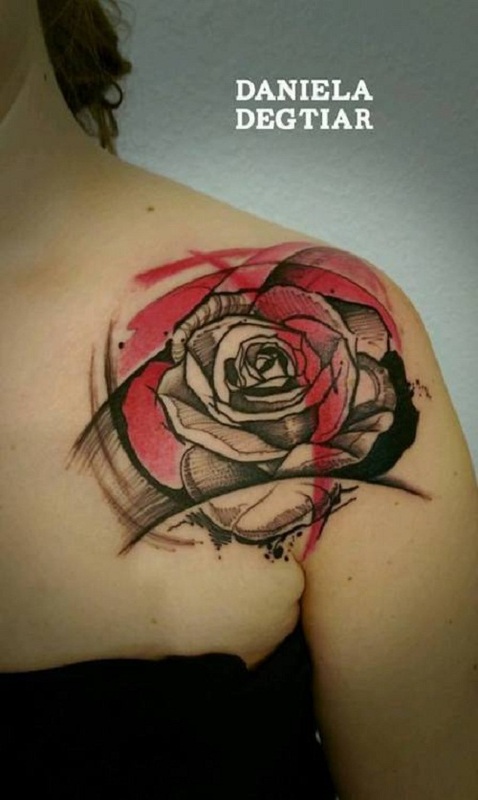 But don’t expect that it will look like ordinary sweet and pretty-looking rose tattoos. 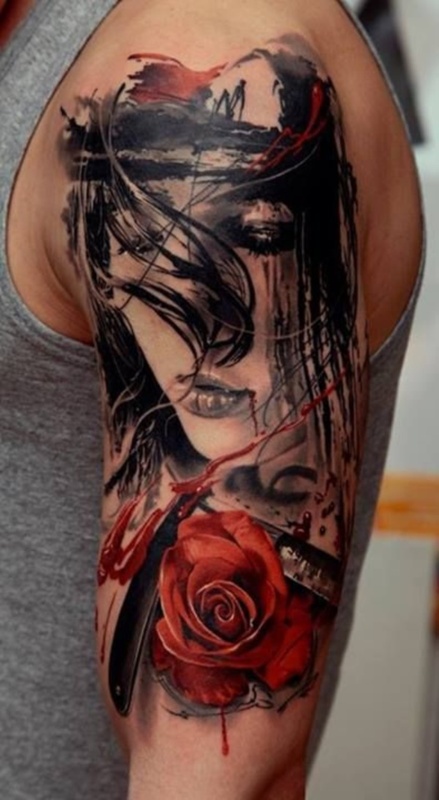 Instead, like any other polka tattoos, it would still look messy and edgy. 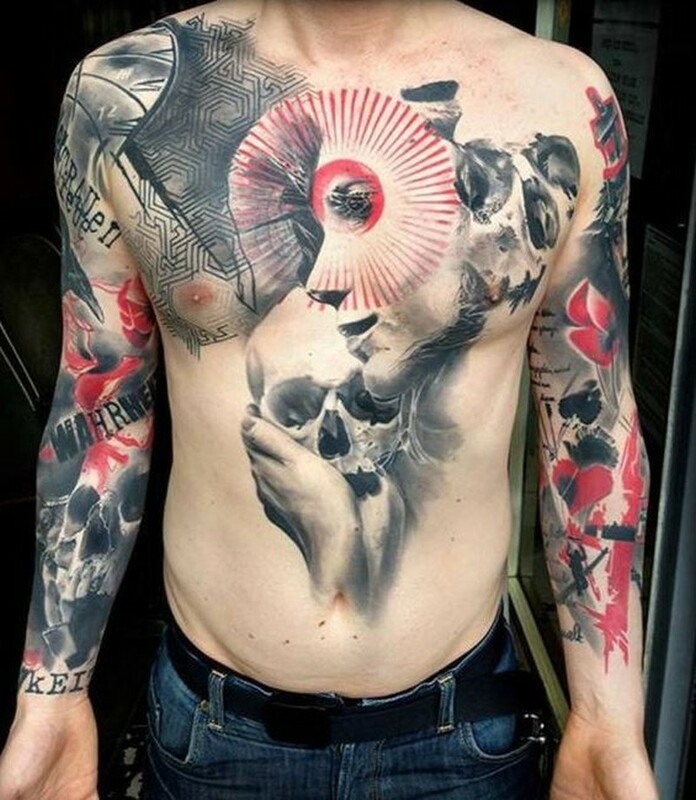 Trash polka tattoos are more common in men than in women. 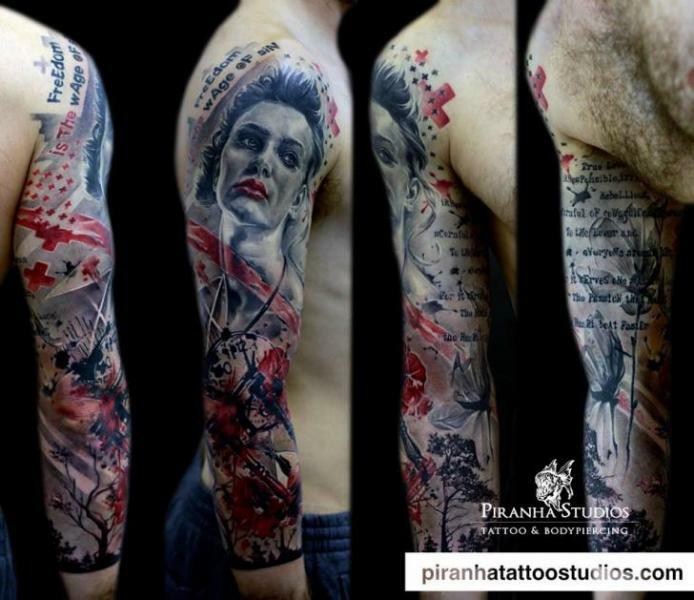 For men, they mostly prefer their trash polka tattoos exposed like in the biceps, forearm, and calf. 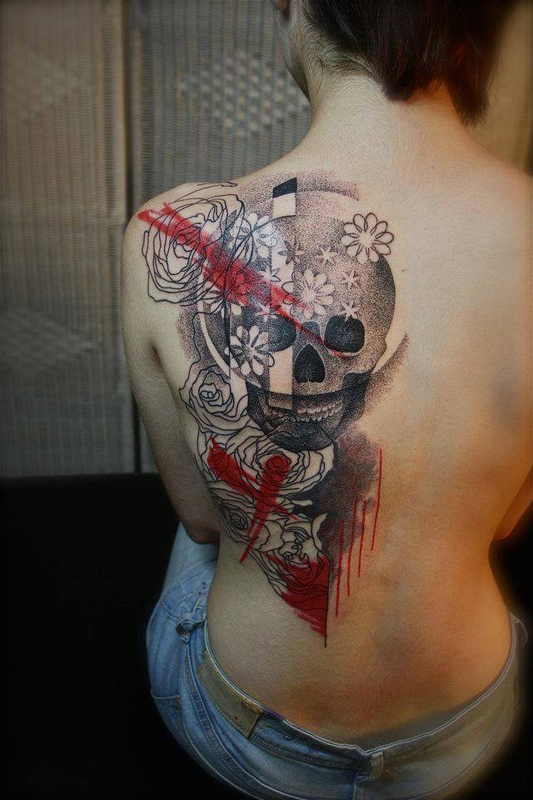 Most of them often place their pieces in their back area too as the back provides a nice big canvas for this type of tattoo. 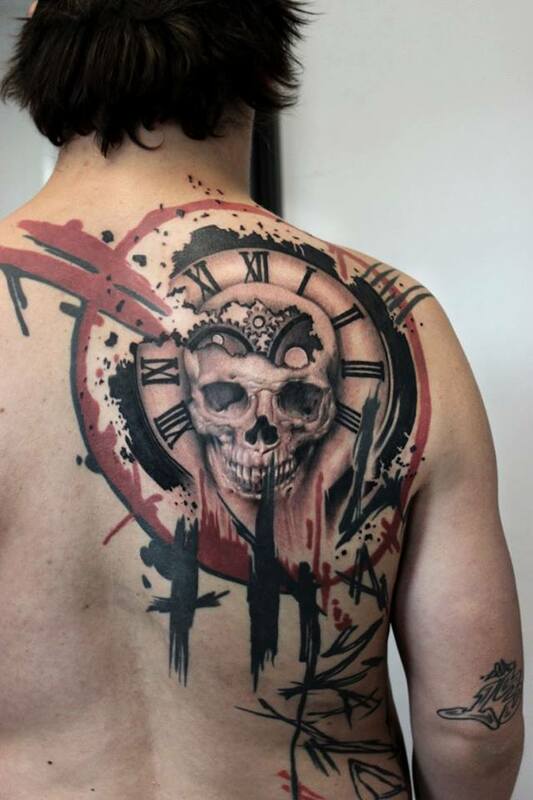 The skull, rose, face, and clock are the common patterns in men’s trash polka tattoos too. 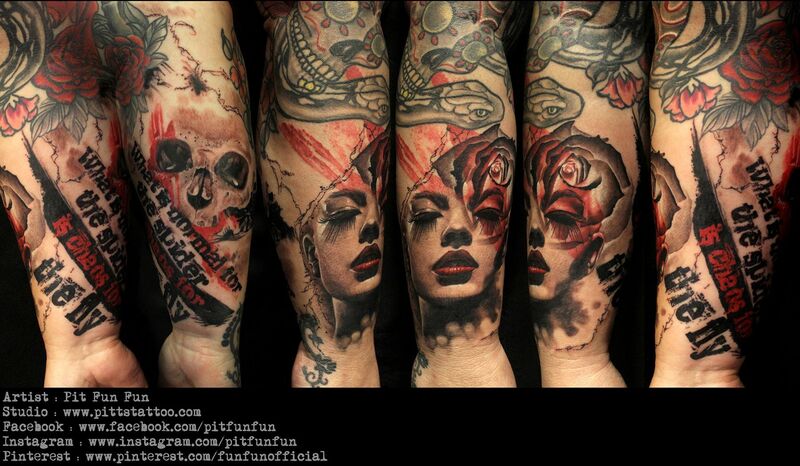 Here are some samples you need to see for your trash polka tattoo. 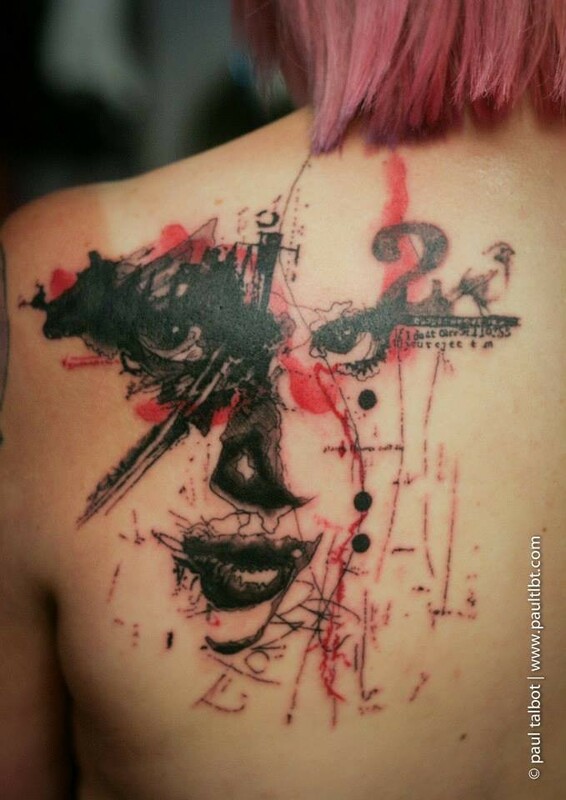 Face patterns are also often found in trash polka tattoos for men. 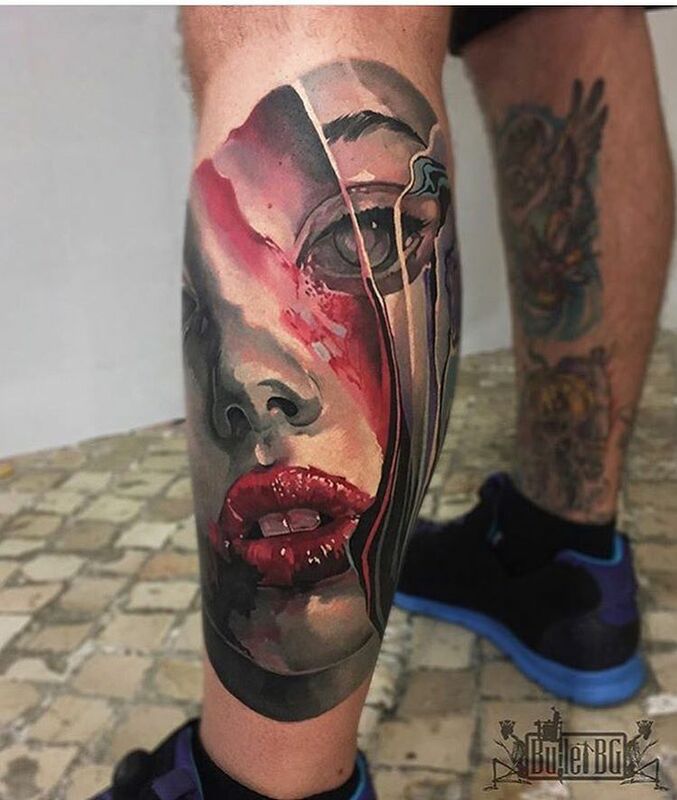 Like in women’s, a woman’s face is also found in men’s trash polka tattoos. 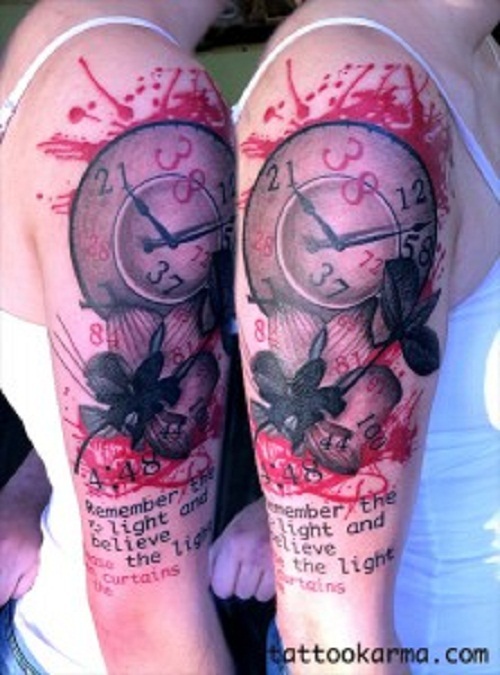 Clocks are yet another pattern that are commonly used in trash polka tattoos. Its variations are often a broken clock or a pocket watch. Roses aren’t just for women but for men too. 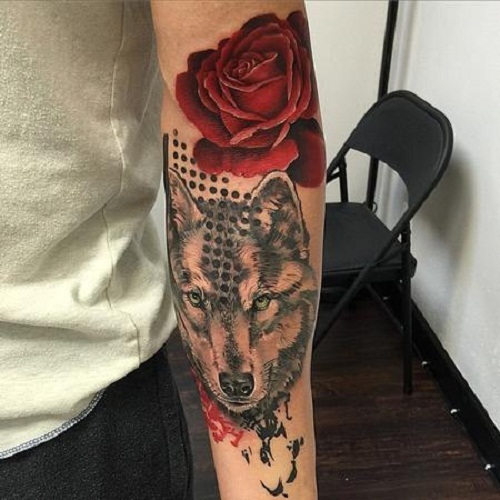 For this reason, roses are also one of the common petterns that you can find in trash polka tattoos. 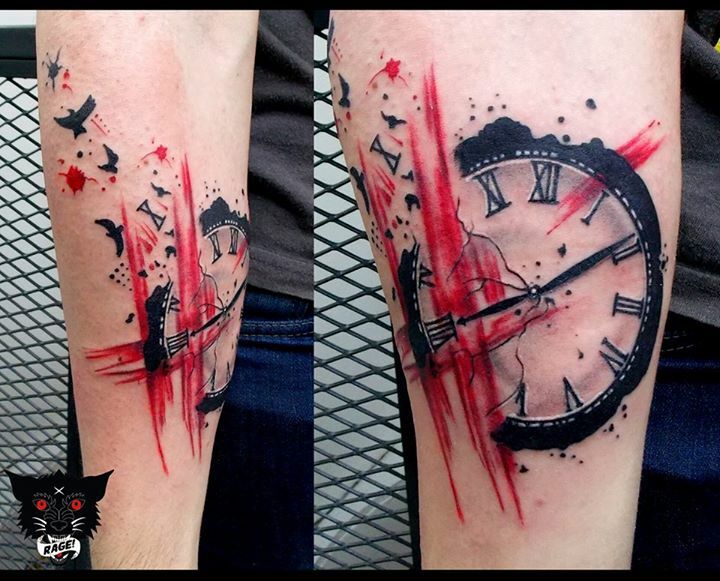 While trash polka tattoos are often in black and red, you can still experiment with you tattoos. You can ask your artist to replace the red ink with blue, yellow, orange, pink or any color that you want just as long as you keep its messy and chaotic aura which is its signature. 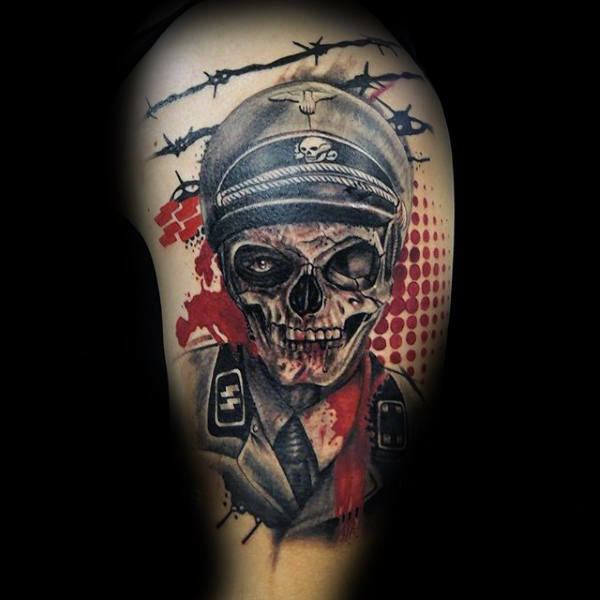 If you have more suggestions on trash polka tattoos, tell us in the comments below.